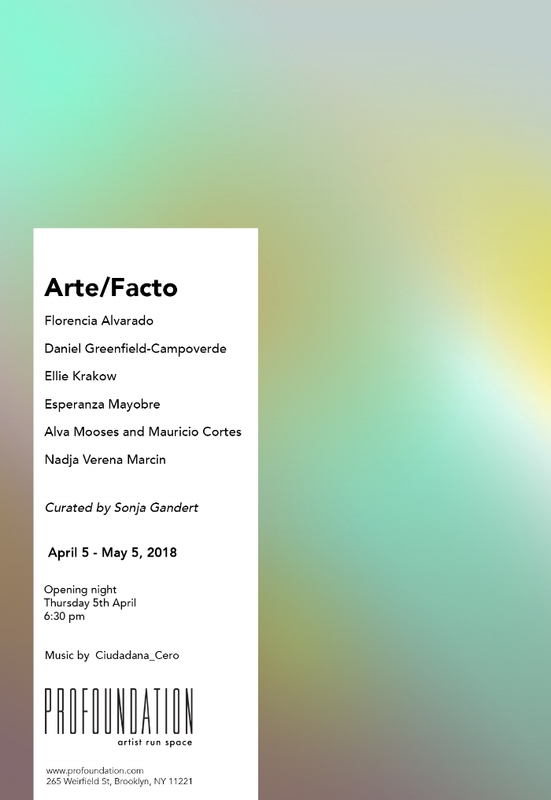 The word artefacto, Spanish for “artifact,” elicits double, even triple entendres and an allusive array of signifiers when split into its two constituent halves: arte and facto. This exhibition, the first at Profoundation, features seven artists working across media to probe the polysemic and multilingual registers invoked both by the artifact and by the notions of arte (art), facto (“made” in Latin, but with a simultaneous nod to facts and their truth value, an area currently under siege in our current social and political climate), and the slash (/) that rends them, thereby asserting both the violence of division and the variability of the optional, the either/or. The artists in this exhibition propose diverse modes of examining themes related to the (frequently spurious) binary of art versus artifact, embodied modalities of making, and the facts that govern our daily lives—and that we often fail to question. Comprising photography, sculpture, printmaking, installation, and video, their works foreground issues of museum display, visual regimes and their imbrication in issues both geopolitical and local, objects as prostheses or physical extensions of the body, meanings hidden behind generalizing catchall terminologies such as “gizmo,” “gadget,” or “contraption”, and found, manufactured, or handmade objects rendered bizarre through memory and forgetting, reuse and misuse, and subversion and invention.